The cybersecurity company beat expectations during the third quarter, and it has a plan to reach profitability by the end of next year. Shares of cybersecurity company FireEye (NASDAQ:FEYE) gained 10.5% in November, according to data provided by S&P Global Market Intelligence. The main driver was FireEye's third-quarter report, which beat analyst estimates on all fronts. 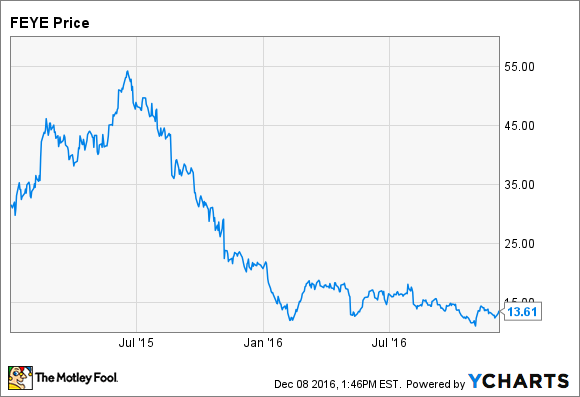 FireEye stock has been tumbling since mid-2015, down nearly 75% from its peak even including November's surge. The company is wildly unprofitable, but until recently, it was growing revenue at such a rapid pace that investors didn't care. Revenue growth has slowed in recent quarters, a development that brought the stock's previous lofty valuation into question. FireEye's third-quarter report featured the slowest pace of revenue growth in its history as a public company. Revenue rose just 12.5% year over year, a far cry from the 45% growth it reported during the third quarter of 2015. But this number was better than analysts expected. Non-GAAP earnings per share -- a loss of $0.18 -- also beat analyst expectations. The company is aiming to slash costs, announcing a major layoff earlier this year, and the first signs of progress on that front showed up in the company's third-quarter results. FireEye's days of rapid growth may be over, but investors reacted positively to the company's newfound focus on the bottom line. FireEye expects to reach non-GAAP profitability by the fourth quarter of 2017, with positive free cash flow for the full year. These targets represent a stark shift from the past, when FireEye aimed to grow revenue as quickly as possible without regard for ballooning costs. With FireEye now on the path to profitability, investors pushed up the stock price in November. I believe we are in the early phases of the richest new innovation cycle in our history, and these are the first of many planned releases that will help customers elevate their security profile at a lower total cost of ownership. The investments we've made in intelligence, orchestration, and integration are redefining the FireEye security platform and creating new engines for growth. FireEye stock gained another 6% during the first seven days of December, propelled higher by a broad market rally. To keep the gains coming, the company will need to follow through on its promise to reach profitability sooner rather than later.